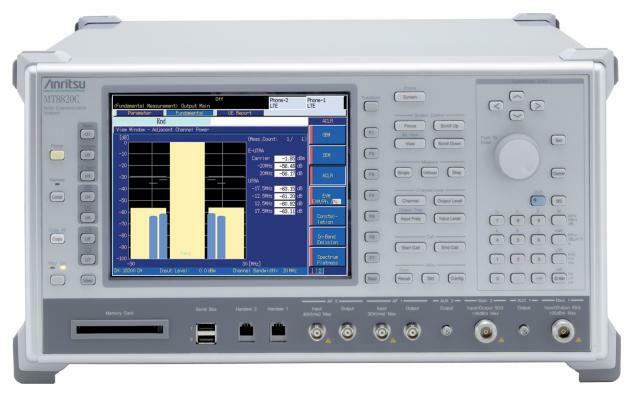 Anritsu Company recently announced the availability of LTE Advanced Carrier Aggregation (CA) Measurement Software for its MT8820C RF Tester, enabling analysis of leading-edge mobile devices incorporating the new ultra-fast technology evolution. The new option leverages the ParallelPhone Mode (PPMTM) dual-RF capability of the MT8820C to simulate inter-band and intra-band downlink Frequency Domain Duplex (FDD) CA with call processing. With the software installed, the MT8820C becomes the first single-box tester with the capability to conduct three critical CA receiver measurements, providing LTE device designers and manufacturers with a cost- and space-efficient solution. The MT8820C RF Tester is a multi-format 2G, 3G, and 4G/LTE tester with capability for wireless device calibration, RF parametric testing, and functional testing, including call processing or no-call based testing. The MT8820C currently supports LTE (FDD and TDD), W-CDMA/HSPA to DC-HSDPA, CDMA2K to single and multi-carrier 1xEV-DO rel. A, GSM/(E)-GPRS, and TD-SCDMA/HSPA. Through Anritsu’s unique PPM technology, combinations of these technologies may also be supported, including SV-LTE, SVDO, CSFB, and redirection. PPM also enables other technologies that require two simultaneous RFs, including DC-HSDPA, LTE 2x2 MIMO, and now FDD downlink CA, to be tested more effectively.